Origins Plantscription Powerful lifting cream is an anti-aging face cream that works to provide more youthful-looking contours and firmer looking skin. Origins Plantscription Powerful lifting cream contains African Anogeissus, a tree bark extract that boosts skin's collagen levels, leaves skin feeling firmer and more resilient and Indian Commiphora which helps to re-plump skin. Use regularly for smoother, firmer and lifted looking skin, infused with youth-renewing moisture. Active Ingredients: African Anogeissus, Indian Commiphora. Treatment Type: Anti-Ageing Face Cream. ORIGINS Plantscription Powerful lifting cream 50ml was found on 2 websites and was price compared using EAN: 0717334193253. 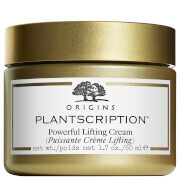 The cheapest ORIGINS Plantscription Powerful lifting cream 50ml is shown as the main item, prices range from £52.00 to £52.00, excluding delivery. Price comparison based on price and delivery charges, with any valid discount codes being applied, is shown in the table above. Prices and information correct at the time of publication.